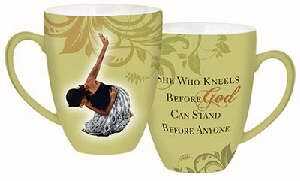 Artistic design on ceramic mug, She who kneels before God can stand before anyone. Soft green swirl and figure design. 15 ounce mug 4.25" x 3.5".